A quilting friend passed away earlier this year and her husband has been struggling with how to dispose of her more-than-ample stash of fabric, yarn, quilting threads, and crafting supplies. This has weighed heavily on my mind in recent days. What will happen to all my "stuff"? How will the family handle it? How can I make the job easier for them? I decided the first order of business is to get rid of things I don't want/won't use right now! So far I've set aside 39 yards of fabric from my studio shelves to donate to various causes. Then I went to the closet to see what other miscellaneous items I could purge -- except, I couldn't get in for the mess. That set me off on a cleaning spree (more on that later). I've cut back considerably on my teaching and have a number of class samples and stepouts that I no longer need. One of these is my own design, 60 Degrees of Separation, that just needed a few seams to put the blocks together. I'm sending this one on to Sarah at Confessions of a Fabric Addict for her quilt ministry. I'll leave it up to her if she wants to add setting triangles top and bottom or just trim to square. Included will be some of the leftover fabric for potential borders. She will also be getting two small tops, a kit, and much of the fabric because I know it will go to good use. The second order of business will be to finish more projects. So that's what on my design wall today. Hop over to Patchwork Times to see what others will be working on this week. Oh, and as far as my Stash Report, nothing came in and I'm not counting anything out till it leaves the house. ... and still a UFO! 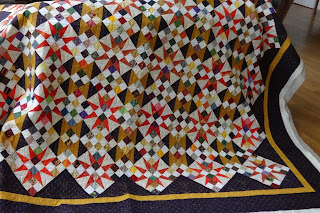 The only "quilting" The Mama did with me while I was still living at home was making log cabin blocks and crazy quilt blocks on a foundation of squares cut from an old sheet. However, I don't recall any of these being made into a quilt; we must have done this as busy work. when denim was making a comeback among the Flower Children. in light and dark denims. I thought I had saved that purse but can't find it at the moment. So these little exercises, paired with Pop's crazy quilt, were the foundation (pardon the pun) for my very first "real" quiltmaking experience. My older son was born in 1966 so he was about 13 when I started this. I used Brian's old jeans, supplemented by some from the rest of the family. 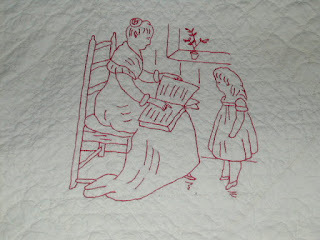 I even started some fancy embroidery, trying to replicate what was on my grandfather's quilt. Have you ever made a denim quilt? The dang thing is HEAVY. It has moved with me, in a white garbage sack, in this unfinished condition, around two apartments and four houses in Tennessee ... and it's still unfinished!! I count this as my oldest dinosaur .... well it's a tie with one I inherited from my mother which I will show you next week. I'll be joining up with Krista at Krista Quilts for Throwback Thursday. Linking now since Krista forgot last week. Trying to crank out 8 blocks a day on Top-Notch Diamonds. I'll tweak the arrangement when they're all done. Just trying not to duplicate any combos. Dinner on Monday night with the church ladies -- Suppin' Sisters. It was a perfect evening for dining al fresco at this new-to-me restaurant on a barge at a marina. While the company was exquisite, the sunset was moreso. In conversation with the lady to my left (not pictured) we determined that her grandparents bought the house I grew up in from my parents back in the late 70s. What happened to my "finish two, one new" rule? I've started yet another new project. But it was self-defense, I assure you. Remember this spring "modern" fabric disaster? ... I proceeded to cut them all entirely into 1.5" strips. My concept failed and I've been staring at those strips hanging on the rack for six months. The mess needed to go; the sooner, the better. I saw this pattern in the October 2015 issue of American Patchwork and Quilting and I could see how my strips might work. Besides, 60 degree is my shtick... So this is what is on my design wall this morning. There will be a bunch more with lighter gray diamonds and possibly more color. I'm working in groups of 8 so that I can get a nice dispersement of fabrics. Another trip to The Quilting Squares resulted in 4.25 yards in. I needed some less-busy fabrics to neutralize the active prints in this Five and Dime project. All the blocks are made, just waiting for a design wall (or floor) big enough to hold them. A $5/yd purchase from a friend gave me an additional 6 yards. Red, yellow, and purple tone-on-tones are always useful. I had already gone through as much from an earlier purchase several years ago and I was pleased that she still had some in stock (and that she could locate it after two recent moves). At this point last year I had purchased more, also used more, and still I was 35.75 in the hole. So I'm improving, right? Throwback Thursday has certainly gotten me reminiscing about some of my early projects disasters, but first I want to feature yet another family antique quilt -- my grandfather's crazy quilt. Like the two pieced quilts I showed a couple of weeks ago (sorry I missed last week, no WiFi when I needed it), this quilt was also stored out of sight in our home when I was growing up. Not much was ever said about it. I have no idea who made it. In the deep recesses of my mind I recall my mother saying it was made from Pop's suits. You can see that some of the pieces show the cutout for armholes and sleeves. You can also see that it was constructed in large rectangles. It appears that the oddly shaped pieces are stitched onto the muslin foundation by hand. Woven tape - check out the stitches! ... and woven tape thrown in. The variety of embroidery stitches has entranced me for years; I never get tired of studying them. ... and the pink yarn ties on the back do not go through to the front; they only catch the muslin foundation. There is no batting. Next week you'll see how this quilt inspired my earliest attempt at quilt making -- also my oldest UFO! 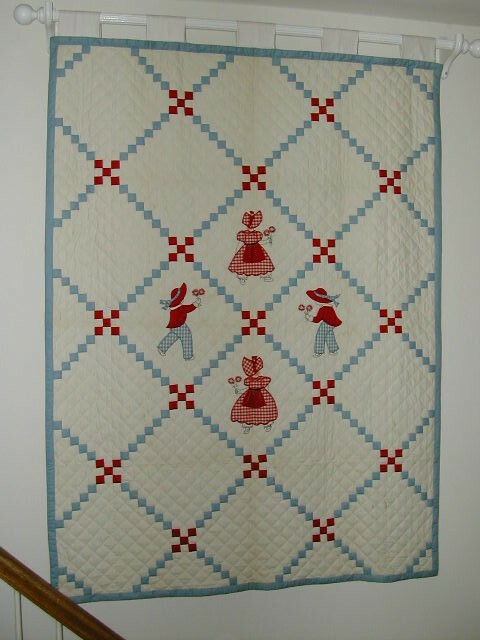 Linking up with Krista Quilts for Throwback Thursday. it really helps relieve the guilt when I have the urge to start something new. I finished two tops at retreat last week; I've earned a fresh start! My secrect sister gave me an unusual pack of 10-inch squares -- Melbourne by Andrea Komninos for Benertex. You might gather from the collection name that it has a bit of an aboriginal look and yet it's not "in your face." The colors of brown-gray, green, and aqua are so lovely and so don't go with much that I already have. Hence my stashing spree last Friday. Hmmm .... which project should I choose? The print motifs are mostly large and don't lend themselves to being cut into small pieces, so I thought a project from Loose Change would best show them off. In these projects you layer a charm square on a 10" square -- some square, some on point -- with raw edge applique and then you slice and dice in various ways. I wasn't able to find the matching charm pack so I cut some 5" squares from FQs and yardage using a wavy blade. My first project from this book had square placement and square cuts. This time I am again going with a square placement, but I'm considering diagonal cuts. Although it's not necessary, the companion Five and Dime Ruler by Kansas Troubles Quilters makes centering the charm square very easy, regardless of which way you want to orient it. ... I can hardly wait to see how this is going to turn out. That would have left me in the hole by just 1/2 yard!! You know how it is when you're given new fabric -- the design wheels start turning, you take a mental inventory and realize you don't own anything to go with the new fabric, you fall off the wagon (rinse and repeat). Since I had to take the Baby Lock machine in for service after screwing up the needle threader, I took the opportunity to look for a Melbourne charm pack (the Benartex website implied that the shop would have it). No evidence that they ever carried that line. But I found several FQs -- 12 to be exact -- that I felt would go well considering I was carrying the color palette in my head. When I got home and in a good light I found only 3 were total rejects. At least I'm moving in the right direction! Have you ever had a day ( or two) like this? After greeting everyone and making a nest, my first task was to bind Cathedral Stars. All went well till I realized I had not made enough binding. To be honest, I think that binding really went with something else, but it matched so I grabbed it. I did have the foresight to bring extra fabric JIC. So I made a bit more, got to the end and cut the 45 degree connection in the wrong direction! Binding on Black and Tan Pineapple went well; however, I didn't attempt the join. That will wait till I can get home to the tool. Some assembly on Candy Dish was accomplished before it was time to go to bed. That was successfully finished this morning, along with the back. I was on a roll! Or so I thought .... I was all set to put the borders on Classic 4-Patch, forgot I planned to miter the corners and cut the border too short. As I analyzed how to fix it I realized I didn't have enough fabric to do that. I needed food at that point. After lunch, halfway into assembling the border rows for Radically Random the tension messed up and I jammed the needle threader off it's track. Thankfully I had the foresight to pack my normal retreat machine -- only because I thought I might need some of the tools I carry with it. Pack up machine 1, unpack machine 2, unsew and resew the messed up seams ... finally finished after dinner and I'm bushed. The good news is that the binding is fixable, I'll come up with a border solution when I'm rested, and I'm extremely happy with my two finishes. The S'mores summer retreat starts today. Three days of fun and frivolity!! It's been an active summer for most of us dealing with family and houses and cars and appliances and life itself. And to make matters worse, we lost one of our members to cancer early this year so I know there will be a lot of hugs and a few tears will be shed. I really need the big tables to work on this and since the rows are done it would be easy to finish, even with distractions. Paper piece remaining units for Summer Heat. Another project that won't require a lot of thought, once I get back in the groove of paper piecing. As a backup I'm taking New York Beauty blocks because I will have the BabyLock machine with the thread cutter, but I think that's a little ambitious. Visiting with my friends, some coming from NC, GA, IN, and KY, is much more important! Linking up with Connie and friends at Free Motion by the River for Linky Tuesday. Do you want your fabrics to play well together? I usually do. Or, perhaps more accurately, I want them to speak the same lanquage. Seems like if I'm using antique reproduction fabrics, they should all be reproduction -- or at least have the same "look" of a reproduction fabric. If I'm using 30s, I think they should all look like 30s. It's just that control side of me. I know, in a really scrappy quilt it doesn't matter, but at that point the fabrics are cut to such small pieces that it's hard to tell what they were originally. I was searching the shelves for "ugly" fabrics to give away, things that I have avoided using for years and therefore would probably never use. You've got some of those, I'll bet! I pulled down a stodgy-looking floral -- mostly pink and sage on a black background -- that probably came from the sale table at Hobby Lobby because never on my worst day would I have paid full price for it! Hmmm .... it wouldn't take much time to cut and finish the blocks and then I could pass it on .... but would somebody else have an appropriate sashing fabric? I know -- I could pull another "ugly" to go with it .... And maybe I should precut the sashing strips so it would be obvious how they should be used .... Can you see where this is going? I searched the shelves and the fabric that matched the best was a polka dot! Too frivolous for a serious floral, was my first thought. But I couldn't get away from the fact that it was a perfect color match. It even had matching pink dots! And suddenly the floral lost some of its seriousness. After all, serious grandmas play well with frivolous grandchildren and they all have a great time, right? 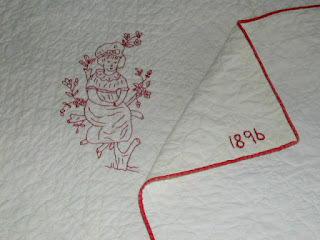 Then I added a 19th century repro for the cornerstones and a timeless print for the border. Guess what? Several bloggers have what they call "Throwback Thursday" and I've been pondering how I might participate .... what could I drag up? 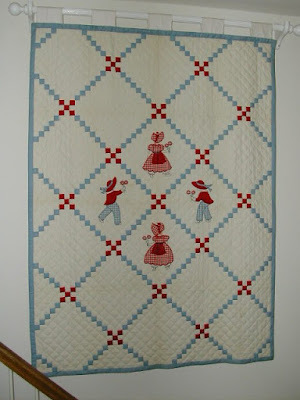 Krista at Krista Quilts is using her Throwback Thursday to focus on some of her early works and I've decided to accept her challenge to take a look at some of my early works as well as some family quilts. I was not raised in a house with quilts. We slept under blankets and bedspreads. There were a couple of quilts in the cedar chest and periodically I would sneak a look at them, wondering why they were so special to be kept out of sight. Since my sister-in-law showed an interest, she and my older brother inherited the two pieced quilts. 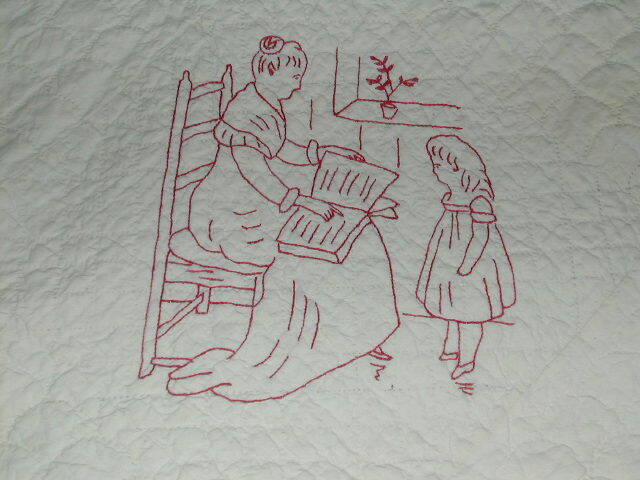 My favorite features a variation of Sunbonnet Sue and Sailor (?) Sam. It's about crib size. Now that I know a little bit about quilt history, I suspect it may have been made for my oldest brother Billy (born 1937) who only lived to about age 2. The quilt is in pretty much pristene condition and my brother has it displayed on a stairwell wall. The second one is covered in Kate Greenway redwork embroidery. 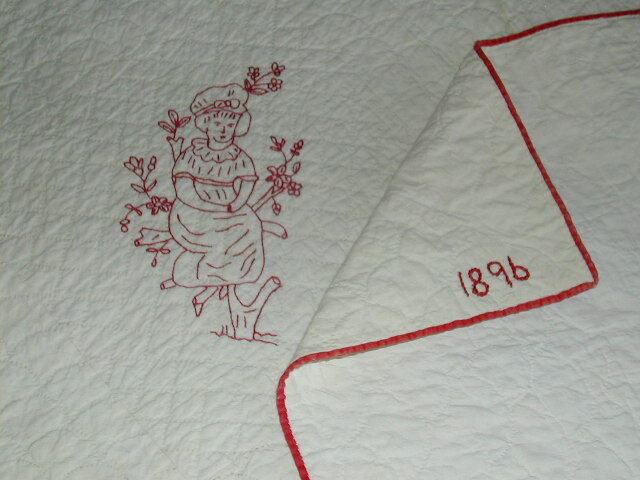 The quilt is dated 1896 -- about the time my maternal grandmother married so perhaps it was made in anticipation of children. My mother, an only child, was born in 1909. Again, as I remember it, it is in near pristine condition. Kinda makes one wonder -- who were they made for, and why were they saved? 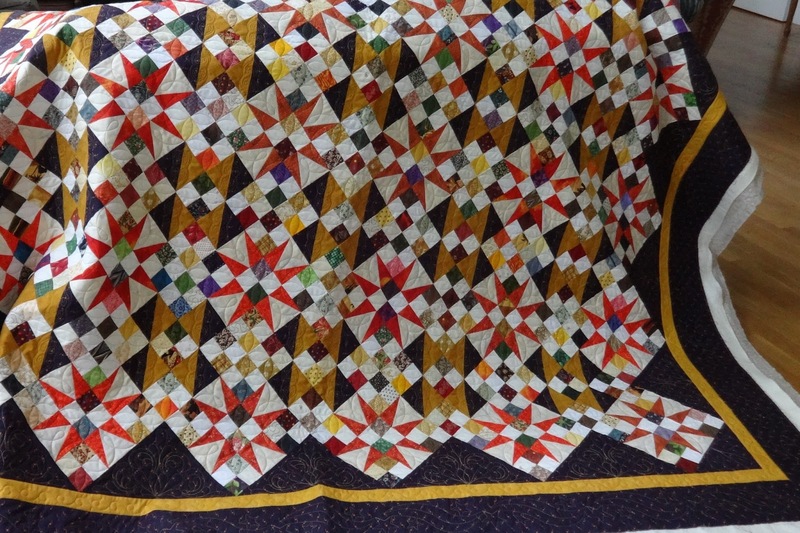 Next week I'll show the one quilt I did inherit -- a crazy quilt made from my grandfather's suits. I encourage you to visit Krista's blog to see what others are showing. I'm also linking up with Quarter Inch from the Edge. Uber activity from a week ago did not carry over to the past week, unfortunately. But that one seam gave me a finish for the week! Athena Orange (erroneously identified as Athena Blue last week) is done. No more Greek key blocks left! When all those blocks I made early in the year did not play well together, I put together three small quilts, instead. I fibbed a little bit ... I stitched a few more of the spire units for my New York Beauty blocks. Talk about a diverse design wall! I spent all day yesterday and part of this morning cutting the remaining units for the NYB blocks. I cut far more than needed because I want flexibility to chose pleasing combinations that show off the batiks. This will be my major project at next week's retreat, after I get the binding sewn onto Black and Tan Pineapple and Cathedral Stars. The rest of this week will be devoted to getting the house ready for grandkids who are coming for a short visit this weekend. Linking up for Design Wall Monday at Patchwork Times.